If you have been looking for an earring that you can adorn to high profile parties as well as simpler events like a friend's birthday, the Amethyst and Diamond Dangle Earrings is an earring you might want to consider. The earring is a simple combination of great quality, colors, and design. The valuable is made of 14k white gold, Amethyst and Diamonds. 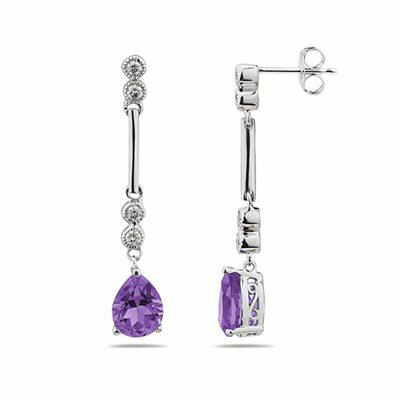 It is a beautiful earring with a purple Amethyst at the bottom. This gemstone is pear shaped and 8x6mm in size. The diamonds are smaller and round shaped. Together, these form the beautiful floral design of the push back earring. The earring will enhance your beauty. It will look exceptionally great with classy dresses that match the subtle purple hue of the Amethyst. We guarantee our Amethyst and Diamond Dangle Earrings, 14K White Gold to be high quality, authentic jewelry, as described above.